Includes: primary pit, wind guard, arch-shaped kettle hanger, grill grate, additional (wok) pit, coal shovel, extenders (large, small). 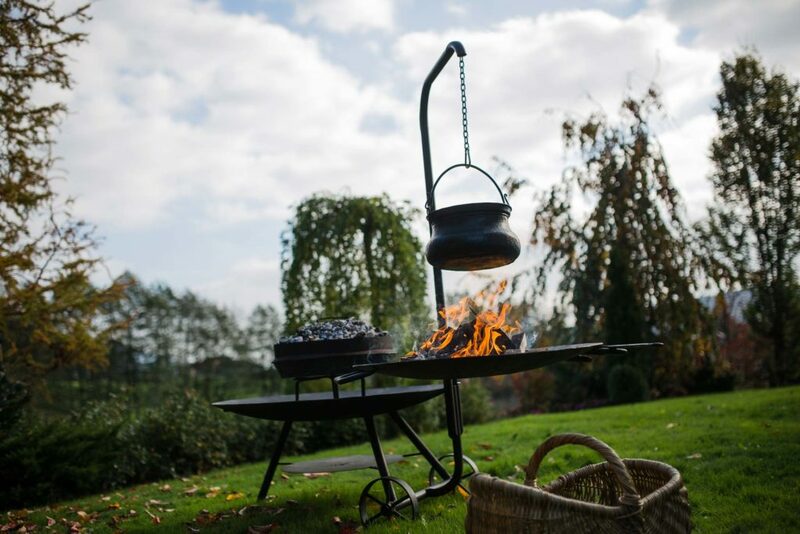 Primary Pit – the base unit of the Open Fire is a hearth designed for making and maintaining the fire. The wheels at the rear side allow for effortless transport of the unit to any location desired. 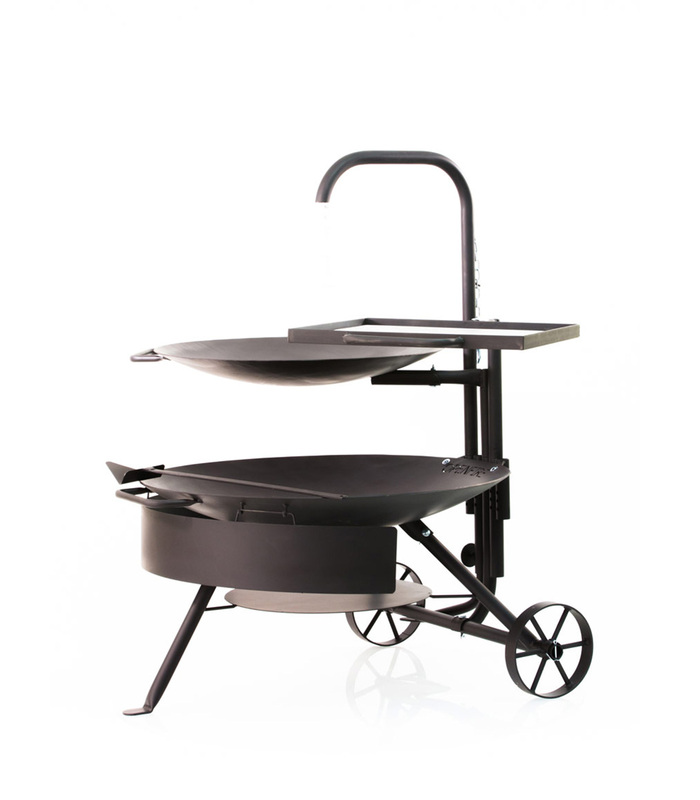 Extenders for additional attachments transform a simple grill unit into a versatile outdoor kitchen. The Heat Deflector under the pit protects the surface, weather it be grass or wood. All units that are not exposed to high temperatures are protected by additional colour layer. Wind Guard – moderates oxygen to the coal and maintains coal in one place. The guard can be moved along the pit edge and may be stored on the stands under the pit. 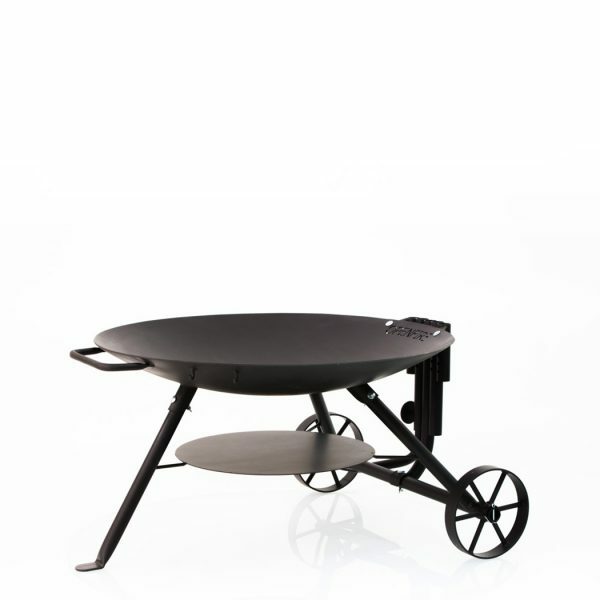 Grill Grate – is made of 6 mm thick iron, which makes it amazingly endurable. 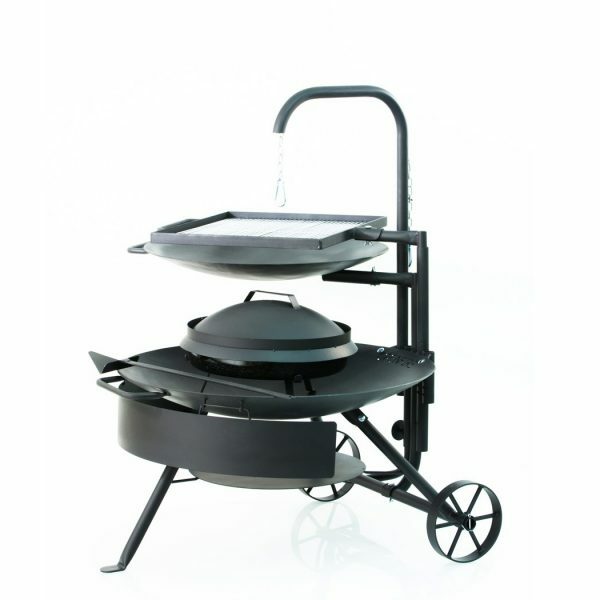 It is designed for all kinds of grilling, allowing smoky aromas to soak any dish. Additional Pit – can be used when preparing fire and coal. It is most useful when cooking various dishes simultaneously. Arch-shaped Hanger – The kettle hung onto the hanger may be of various sizes. The chain allows us to adjust the distance of the kettle from the fire. Extenders small/large – enhance the multifunctionality of the Open Fire Set. By the use of extenders all attachments can be lifted or lowered. The additional pit and the grill grate can be set at a new level, while the coal embers are maintained in the primary pit. Coal Shovel – is used for rearranging the fire and embers around the pit, moving the attachments, and for removing the lid of the Dutch Oven.